The Union health ministry is all set to commence drafting of Drugs and Cosmetics (Amendment) Bill to amend the Drugs and Cosmetics Act, 1940 for upgradation and introduction of provision for newer areas of biological, stem cells and regenerative medicines, medical devices and clinical trials after the Budget. This would be in step with the central government’s ‘Make in India’ initiative. The move was welcomed by Organisation of Pharmaceutical Producers of India (OPPI). According to a senior health ministry official, the work on draft of Drugs and Cosmetics (Amendment) Bill will begin after the Union Budget which is scheduled for February 1. The Bill proposed to cover new areas of biological, stem cells and regenerative medicines, clinical trials as well as compliance to regulatory issues. We are coming up with separate legislations for regulating medical devices and drugs and cosmetics. A set of draft rules for medical devices was prepared by the ministry and released last year. The Medical Device Regulations will be issued within a week, he added. The Bill aimed at strengthening regulatory mechanism to ensure delivery of safe and quality medicines and facilitating ease of doing business in India will be finalized with consultation of all stakeholders including pharma industries, patient groups etc. Meanwhile we are revising regulations pertaining to new drugs, clinical trials, cosmetics to meet our current challenges and regulatory compliance requirement by amending the existing Drugs and Cosmetics Rules, the official added. In June 2016 the government had withdrawn the Drugs and Cosmetics (Amendment) Bill, 2013 as it believed that would not be appropriate to make further amendments in the existing Act especially as newer areas of biological, stem cells and regenerative medicines, medical devices and clinical trial or investigation cannot be effectively regulated under the present law. The Bill had been introduced in the Rajya Sabha. A Standing Committee of Parliament had made a number of recommendations for changing the provisions of the Bill. Meanwhile, the OPPI has welcomed the decision of the government to revisit the Drugs & Cosmetics Act & the Rules. Amendment of the 1940 legislation would undoubtedly ensure delivery of safe and quality medicines and at the same time facilitate ease of doing business in India. Given the dynamic nature of law as well as continuous advancement in science, importance of updated, effective, and streamlined drug regulations becomes paramount. OPPI believes that amendment in the existing regulations would certainly help remove ambiguities, augment research and innovation in India which, in turn, will enable bringing in new medicines to save and improve the lives of Indian patients. “OPPI is appreciative of the fact that the Committees constituted by the Government to look into various aspects of law such as new drugs, clinical trials, manufacture etc. are engaging with stakeholders in the evolutionary process. OPPI looks forward to a continued engagement with the government in its endeavour to establish a transparent, process-driven and standardised regulatory structure,” said Kanchana TK, Director General, OPPI. This entry was posted in Central Drugs Standard Control Organisation, Drug Controller General of India. The Drug Technical Advisory Board (DTAB)’s move to approve change of name of the ‘Central Drugs Standards Control Organisation (CDSCO)’ to ‘Indian Drug Administration (IDA)’ will now mandate a dedicated pool of qualified workforce to man regulatory system. This will take India on a global platform like that of US FDA and EMA, said Dr BR Jagashetty, former National Adviser (Drugs Control) to MoHFW & CDSCO. Following the 75th meeting of DTAB held on January 3, 2017, the Board’s approval to rename ‘CDSCO’ as ‘IDA’ to make it simple and befitting to its activities is the best that could happen to India’s regulatory office, he added. During 2014, it was Dr Jagashetty in his role as the National Advisor who pressed for the CDSCO to be transformed with a name change to IDA and be given a different identity for an immediate recognition as an Indian Regulatory Authority across the globe. “Now the IDA will lay the foundation for qualified pharmacy professionals and this will automatically spur rapid license approvals in a transparent and efficient manner,” he said. Once the name change is approved then the Government of India may direct all states to incorporate similar names in their states for administration of drugs like respective State DA (Drug Administration) or Respective State FDA (Food & Drug Administration) to bring in uniformity throughout country. At the same time the Government of India should also introduce the Indian Drug Services (IDS) examination through UPSC for candidates to lead the IDA. This examination needs to be designed on par with the Indian Administrative Service (IAS), Indian Police Service (IPS) and Indian Foreign Service (IFS). This IDS cadre may be known as Drugs Control Officers instead of Inspectors. They could be selected through UPSC and posted to various State DA or State FDA like that of IAS/IPS/IFS cadre. As and when required their services could be obtained or on deputation to IDA or other departments of health & family welfare, Ayush, food, veterinary, forest, chemicals, fertilizers, agriculture, industry, revenue, patents etc depending on the need. The position would exercise focused drug administration including framing and implementation of policy in consultation with the related ministries. Further, such a system would create a proper hierarchy and bring in a systematic reporting structure which is uniform to both Centre and State, Dr Jagashetty had said in an earlier interaction with Pharmabiz. Dr Jagashetty, who was also the erstwhile chairman of the DCC sub-committee for Amendments to Drugs & Cosmetic Rules constituted by DCGI, feels that the Indian drug regulatory authority which scrutinizes the worlds’ third largest manufacturing base of pharma products by volume and 14th in value terms needs to have a more powerful image internationally. In an era where patent expiry opens up opportunities for IDA personnel to approve not only branded biologicals but biosimilar and generic formulations, apart from new drug delivery devices like skin patches and inhalers. This is an age of innovation where information technology reigns and therefore online issue of licenses for sales and manufacturing and instant information of pharma companies will need in-depth skill training. “It is high time that CDSCO aligns itself to its change of name to IDA to be more appropriate in the current context of developments of Digital India, Make in India, Uniform Code Pharmaceutical Marketing Practices (UCPMP), medical devices policy, price monitoring cells,” said Dr. Jagashetty. This entry was posted in Bacteria, Central Drugs Standard Control Organisation, Drug Controller General of India. The Union health ministry has issued the revised Electronic Health Record (EHR) standards-2016 which is a continuation of its earlier version. In many ways they reflect the growing confidence in the path correctly chosen earlier – providing a set of international and proven standards with focus towards achieving syntactic and semantic interoperability of health records. The idea behind the introduction of EHR by the health ministry way back in 2013 is that any person in India can go to any health service provider or practitioner, any diagnostic centre or any pharmacy and yet be able to access and have fully integrated and always available health records in an electronic format, which is not only empowering but also the vision for efficient 21st century healthcare delivery. The ministry had earlier in 2013 issued the EHR standards with an objective to introduce a uniform standard-based system for creation and maintenance of EHR by the healthcare providers in the country. EHR is a collection of various medical records that get generated during any clinical encounter or events. The need for an EHR can be understood from the fact that for a health record of an individual to be clinically meaningful it needs to be from conception or birth, at the very least. As one progresses through one’s life, every record of every clinical encounter represents a health-related event in one’s life. Each of these records may be insignificant or significant depending on the current problems that the person is suffering from. Thus, it becomes imperative that these records be available, longitudinally arranged as a time series, and be clinically relevant to provide a summary of the various healthcare events in the life of a person. An EHR is a collection of various medical records that get generated during any clinical encounter or events. With rise of self-care and homecare devices and systems, nowadays meaningful healthcare data get generated 24×7 and also have long-term clinical relevance. 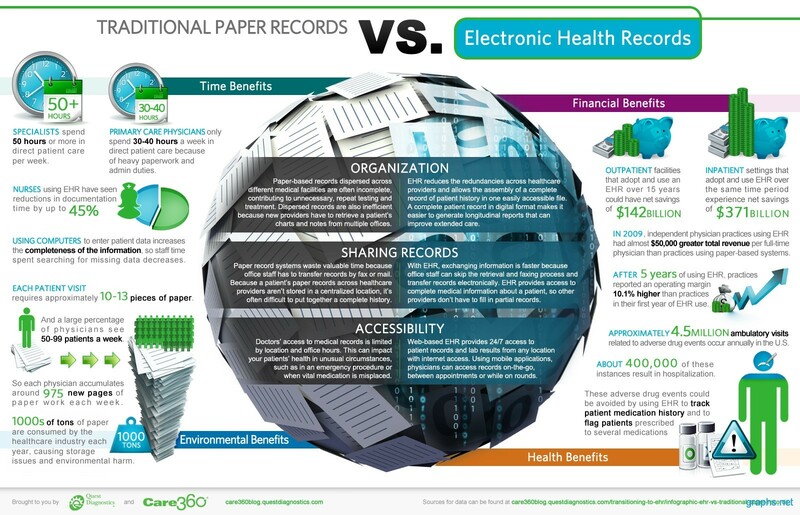 The purpose of collecting medical records, as much as possible, are manifold – better and evidence based care, increasingly accurate and faster diagnosis that translates into better treatment at lower costs of care, avoid repeating unnecessary investigations, robust analytics including predictive analytics to support personalized care, improved health policy decisions based on better understanding of the underlying issues, etc., all translating into improved personal and public health. Without standards, a lifelong medical record is simply not possible, as different records from different sources spread across ~80+ years, potentially, needs to be brought meaningfully together. To achieve this, a set of pre-defined standards for information capture, storage, retrieval, exchange, and analytics that includes images, clinical codes and data is imperative. This entry was posted in Central Drugs Standard Control Organisation, Drug Controller General of India, Health and tagged ehr, electronic health records, Health Ministry.